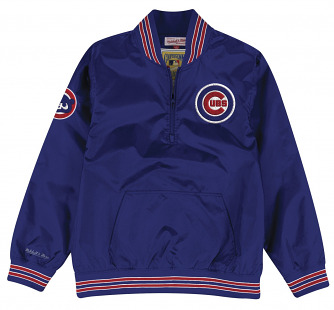 Support your team throwback style in this vintage "Slider" premium 1/4 zip pullover jacket from Mitchell & Ness. This 1/4 zip pullover jacket features 100% nylon oxford fabric with rainwear coating, polyester/cotton lining inside the body, poly taffeta sleeve lining, embroidered tackle twill team logo at the left chest, alternate team logo patch embroidered on the right sleeve, Mitchell & Ness scripted on right sleeve, striped rib trim at collar & sleeve opening and elastic hem, front kangaroo pocket and nylon zipper. Officially licensed by MLB. Tailored fit which fits a little trimmer in the body and sleeves.